Originally posted on February 28, 2017 on the Tiny Cables Medium publication. My friend and Benja co-founder Tommy Goode had an idea. Tired of wires running amok on his desk, Tommy expressed a need for short cables. I laughed. I had never heard someone complain that their cables were too long, only that they were too short. As so often happens, I was limited by my immediate set of observations and circumstances — simply, I never thought that someone with Tommy’s need existed. The idea was hatched in about three minutes. We decided to pursue the idea — more on that later— and have also decided to document our journey in a series of Medium posts in real time. Two guys launching a niche e-commerce project may not be the sexiest topic but we think that you might find a record of our journey helpful, whether we’re successful or not. In this, our inaugural post, we’ve dug into the first steps: evaluating an opportunity, deciding to pursue the project, and establishing our goals. Future posts will include topics like sourcing, fulfillment, marketing, and sales. We’ll be as transparent as we can be: we plan on sharing a running tally of expenses and our sales figures. We’re excited about this and we hope you are, too. Each of these will be produced with a length of 4–6" and they’ll come in black. We’ll offer a “request cable” feature on our website and if we get enough interest in a specific cable, we’ll get it made. What does the competitive landscape look like? There is a surprisingly short list of available inventory for tiny cables, the majority of which appear to be non-Apple certified Lightning cables on Amazon. Websites like Monoprice and Newegg sell some, but listings are inconsistent and they don’t appear to be quality. We learned a few things: there are several vendors making a few hundred sales each month, to the tune of ~$50,000.00 in Lightning cables alone. It is validation that people like Tommy exist. Our other searches confirmed that each cable type we’re evaluating has a comparable established market. We filed this information away for doing projections down the road. Niche, but larger than we thought. Can we do it better? / What is our advantage? In a word: marketing. Rather than listing generic looking and sounding items with product names that are just a list of specs, we plan to create a brand around these cables and lean into the advantages that come with a name. Secure a great domain and hit Search Engine Optimization (SEO) hard. Though we thought we would simply be an Amazon seller, this would eliminate dependence on any single marketplace. 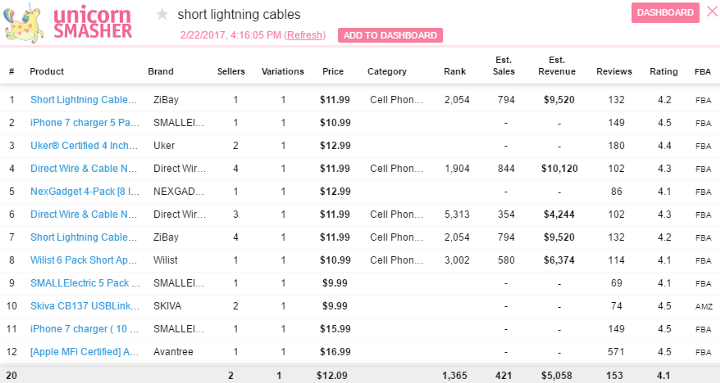 If we locked down anything close to top ranking for key search terms like “short cables,” we could sell through our own site and cut out the Amazon costs. We landed on TinyCables.com, bought it for $12.99 at Name.com. Create a brand/logo that people remember and print it on everything to encourage repeat business. It appears that a person who buys a short lightning cable from Seller A on Amazon will just go back to Amazon and execute their original search all over again, even if they had a great experience with the unit from Seller A. They won’t specifically seek out Seller A and even if they do, they may accidentally order from Seller B or Seller C. We want to be a brand name that people remember to seek out, and one that stands out from the other listings. We produced a simple block logo using Logo Maker on iOS. To remove the watermark, it was $3.99. Possibly run a (heavily-automated) social media effort to maintain top-of-mind awareness. I don’t know how we target people who plug things into a laptop on their desk, people who need short cables for their portable charging brick, or people who are obsessed with maintaining a clean cable situation behind their desktop towers and televisions, but we’ll figure it out. Focus on providing a great product so we earn great reviews. Reputation is one of those things that is not built, but earned. This is a little less tangible, but it means we’ll ask our buyers to write a review. What does the cost structure look like? / What is the financial risk? You always hear that charging cables cost “a cent to make in China,” which doesn’t feel great when you’re ponying up $29 at the Apple Store for a USB-C to Lightning charger for that stupid new MacBook. We needed to figure out how close this is to the truth. I sought out quotes from three different suppliers: we secured two on Alibaba, which offers bulk rates on product manufactured overseas. 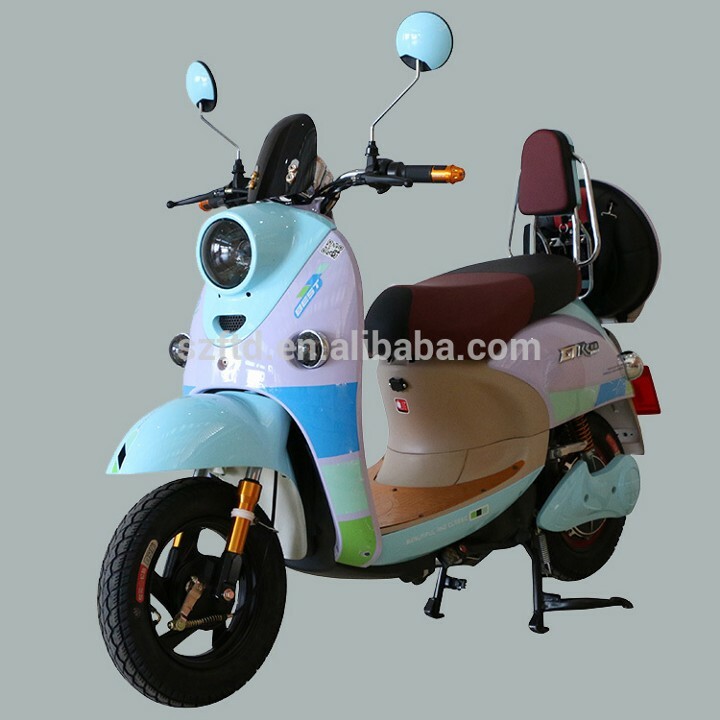 Alibaba has turned into a hobby of mine: if you’ve ever wondered what it would cost to buy 30 off-brand, Chinese scooters, you’ll have a great time poking around their marketplace. You can pick up this bad boy for $250 if you buy 25+ units and don’t mind waiting a few weeks for the shipment from Guangzhou. We got our third quote from a United States-based supplier. This supplier offers manufacturing in both the U.S.A. and China. The first pass at securing these quotes returned some interesting numbers. One of our next posts will discuss sourcing issues, what we did with these, and how we navigated the negotiations but the purpose in this first pass was to see if we thought the simple, back of a napkin cost structure made sense. Prices per unit, by source. The US-based source is selling from their Chinese manufacturer in this quote. All three claim to have Apple-certified Lightning cables, though I personally question whether they’re actually certified at $0.38 and $0.37 per unit. With a plan to sell each cable for $8-ish, these quotes passed the sniff test. Amazon could see that we’re selling a bunch of cables on their platform and they could decide to steal our business. Amazon’s AmazonBasics line already includes a short (4") Apple-certified iPhone cable for $5.99, and they could easily cover the other cables that we want to offer. We’ll compete off-platform (which Amazon isn’t equipped to do — we sure won’t let them sell on our website) and aim to compete on quality. Apple could change which kind of charging cable they use on the next iPhone, which means that our demand for Lightning cables could shrink dramatically overnight. The other cables on our list (HDMI, USB-C, Micro-USB) are not device or brand-dependent. It seems like recent iPhone releases are lasting longer than one cycle so the market may not shrink as much as we think, and we can also simply order fewer Lightning cables than the others. There are ways around this. The gut check: why not? Can you afford the financial risk associated with the up-front investment? Yes, and there is a liquidation value to all of this — it’s unlikely that we would have to eat the entire cost. Is your time better-spent elsewhere? The time commitment is minimal. Once things are up and running, this might represent an hour or two per week and the potential return is worth it. Will your family think you’re crazy for this? Yes, but that’s nothing new. What’s the worst that could happen? An asteroid could hit me in the face tomorrow. The market exists for our product. This isn’t just a weird thing for Tommy. The cost to produce our product isn’t prohibitive and should allow for strong margins. We have an advantage with our expertise in marketing and SEO. We can sell these things. The big threats are things we can handle. We can afford the hit if it completely craters. So, why not? We’re going for it. The thing that I admire most about entrepreneurs is passion. As someone who grew up in a family of small business owners who surrounded themselves with other small business owners, I have seen the sacrifices and energy that it takes to go out and earn a living on your own. People start businesses so they can spend their lives doing what they love to do, and that’s beautiful. 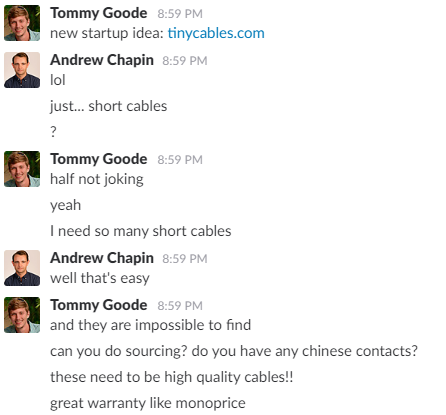 TinyCables.com is not the thing that we love to do. At best, this company is an exploration of our passion for entrepreneurship and it’s us sharing the process with the community. At worst, it’s an opportunistic money-grab. To enforce the “best” version of what this project is, we decided that we’ll donate half of net proceeds to charity. We don’t know what the charity is yet — that’s another post in the series — and we’re open to your suggestions. Comment or tweet us with your ideas. Our goal is to donate $10,000 to the charity of choice in 2017, meaning that we have to sell around 10,000 single units. We also want to learn and turn this Medium series into a valuable resource for the community, so we’ll commit to writing (at least) weekly regardless of progress. We’ll be transparent, raw, and you’ll get the real story with no polish or spin. We offered a peek into the question of sourcing above — it’s more complicated than I ever could have imagined. That’s one of our next posts. If you would like to receive an e-mail when we release our next post, sign up for the newsletter at tinycables.com.